David Fincher’s The Game is at once a noir-ish take on the grand conspiracy genre, while at the same time being a bit of a cynical take on the genre itself. It’s a tight thriller that raises more questions than it answers, and after the success of Se7en, The Game also helped solidify David Fincher as a directorial force to be reckoned with. For me personally, I’m a bit of a David Fincher enthusiast. His work is always overwhelmingly beautiful to look at and it draws you in, latching onto you until the very end. His recent work, including The Social Network and The Girl With the Dragon Tattoo, is very reminiscent of The Game in many ways. It’s a film that seemed to come out of nowhere, and despite being critically acclaimed, seemed to disappear and fall by the wayside. Even with Criterion’s very fine laserdisc release of the film, it didn’t seem to leave filmgoers with much of anything to remember it by. However, for those in the know, The Game has always been here with us. Following Michael Douglas down the rabbit hole is an exhilarating experience. You never know what’s going to happen next and you’re on the edge of your seat from the time it begins until it ends. Fans have been waiting patiently for a more appreciative release of the film on both DVD and Blu-ray, rather than the bare bones release it has received in the past. Even Dr. Jahnke himself personally remarked what a shame it was that the extras from the Criterion laserdisc release were going to waste and that it would be nice to have a DVD collective of the material. Thankfully, that wait is over, and not only do we have a great new Blu-ray and DVD release of the film from Criterion, but also the extra material that’s been sitting in laser rot since 1998. 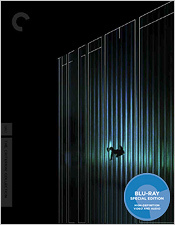 For the film’s debut on Blu-ray, Criterion has afforded a brand new transfer from the original camera negative with supervision by both director David Fincher and the director of photography Harris Savides. The results are quite astounding. There’s a very even quality to the film grain, but there’s also an incredible depth to the image, particularly in the darker portions of the frame. Shadow delineation is very good and blacks are very deep indeed. As is the custom with Fincher’s palette, the colors are quite strong and affecting. Detail is quite amazing, with every fine line of Michael Douglas’ face on full display. Brightness and contrast are also very good, although I think it could have been just a tad bit brighter. I didn’t notice any signs of banding, edge enhancement or any digital manipulation to the image itself, and there are a few artifacts here and there still left behind. So it’s a near perfect image that should leave little to no dissatisfaction. For the audio portion, we’re treated to two different channels, both English 5.1 DTS-HD mixes. One is the preserved original theatrical mix of the film, which is more appropriate for screenings in larger rooms with big sound. The other is what’s called a “near field” mix, which is a better option for home theater setups. The latter was also supervised by Fincher and sound designer Ren Klyce. Reviewing both tracks, it’s not amazingly clear right away what the main difference between the two is. It isn’t until the majority of the score, sound effects and LFE kick in that you really hear and feel the difference. For obvious reasons, the theatrical mix is a bit wider in staging, while the near field mix is a little more closed in. On both tracks, dialogue is perfectly clear, score and sound effects pack a lot of punch and ambience is quite good. There’s also plenty of surround activity to it all. The bottom line is that this is a top-notch set of soundtracks which compliment superb image quality. There are also subtitles in English for those who might need them. As I mentioned previously, all of the great supplemental features from the original 1998 Criterion laserdisc have been ported over for this release, and there’s a treasure trove of material to look through. There’s an audio commentary with Fincher, actor Michael Douglas, screenwriters John Brancato and Michael Ferris, director of photography Harris Savides, production designer Jeffrey Beecroft and visual effects supervisor Kevin Haug; an alternate ending; a set of Film-to-Storyboard Comparisons (Dog Chase, The Taxi, Christine’s House and The Fall); a set of Behind the Scenes featurettes with optional commentary by the aforementioned participants (Dog Chase, The Taxi, Christine’s House, The Fall and Location Footage); the Psychological Test Film that’s seen in the film in its full form; the film’s teaser trailer and teaser render test with optional commentary by digital animation supervisor Richard “Dr.” Baily; the film’s theatrical trailer with optional commentary by Fincher; and finally, a 16-page booklet with an essay by film critic David Sterritt. For fans of David Fincher and fans of The Game, this disc is long overdue and a welcome addition to any film fan’s library. A great film like this deserves only the best of the treatment, and Criterion has delivered the goods yet again. Highly recommended.